1. Do we fire up DVDs? 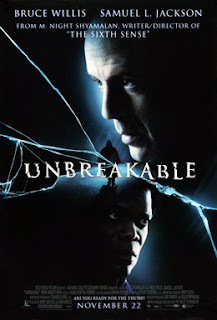 You can make an argument that Unbreakable was the first film to take a serious look at a superhero story while much of the genre as we know it today was still in its relative infancy. Maybe the movie going audience wasn't ready to start taking comic book films seriously? After all, we weren't too far removed from the Schumacher Batman steaming piles of hellfire and around the same time X-Men was making Hugh Jackman a movie star. But Unbreakable? The movie still stands on its own. The story, the characters, the acting... everything works. Some of the camera work from M. Night Shyamalan has some heavy-handed Hitchcockian influence that doesn't age as well, but that starts to veer into the super nit-picky. It's really too bad that we had to wait almost twenty years to see the next chapters in this world, but hey, I'll take what I can get!